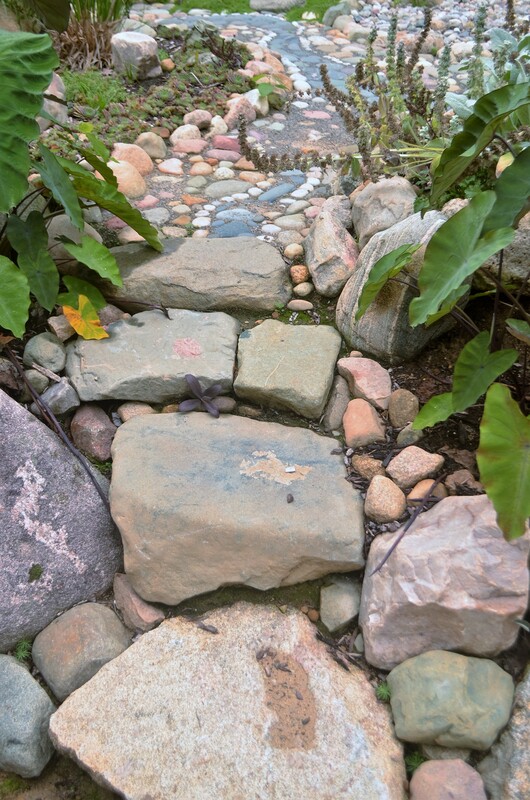 As Rob traveled around the world, he observed several cultures that made use of “courtyard gardens” which are open-air gardens placed inside the confines of four walls. He has been able to explore and photograph these gardens in Mexico, Spain, Morocco, Columbia, Peru, Chile, Portugal, Italy, Greece and Japan. 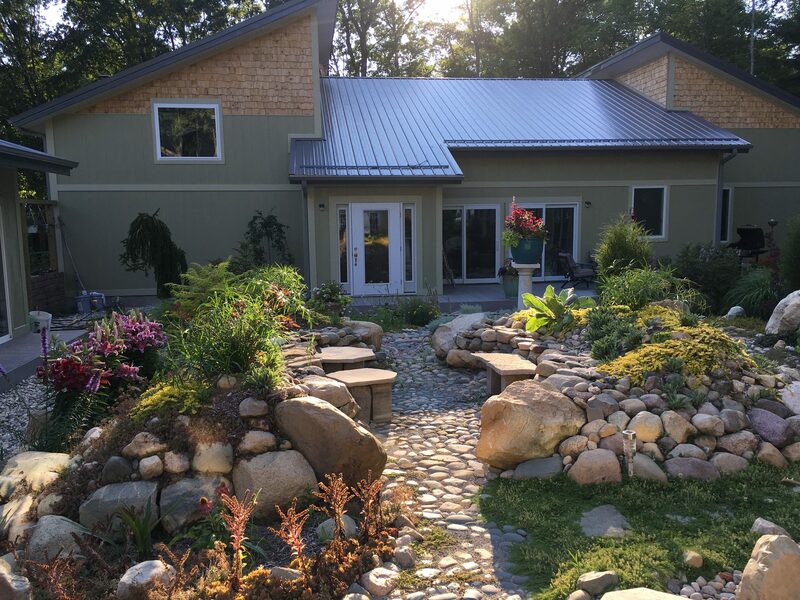 He fell in love with this concept of having an interior courtyard garden and decided to build his own version of one at his new place. 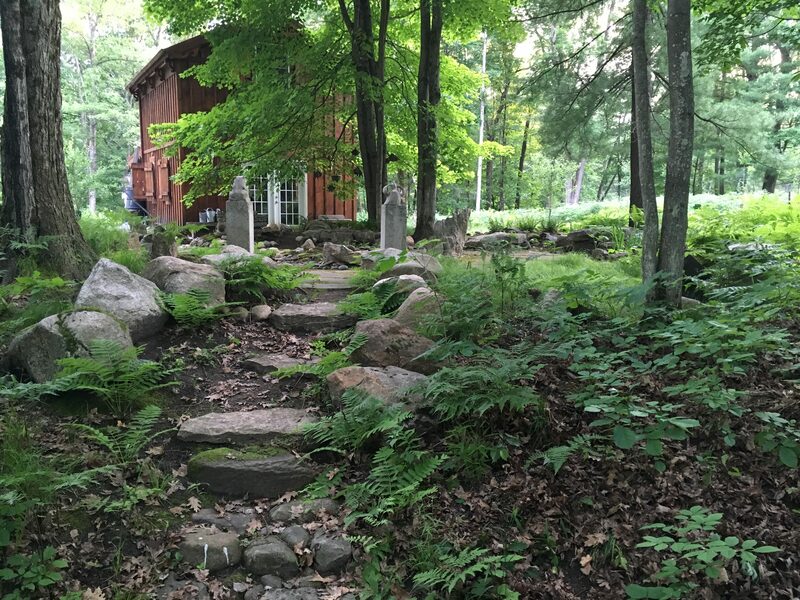 This garden is surrounded on all sides by Rob’s home and art studio with antique iron gates as entry ways. 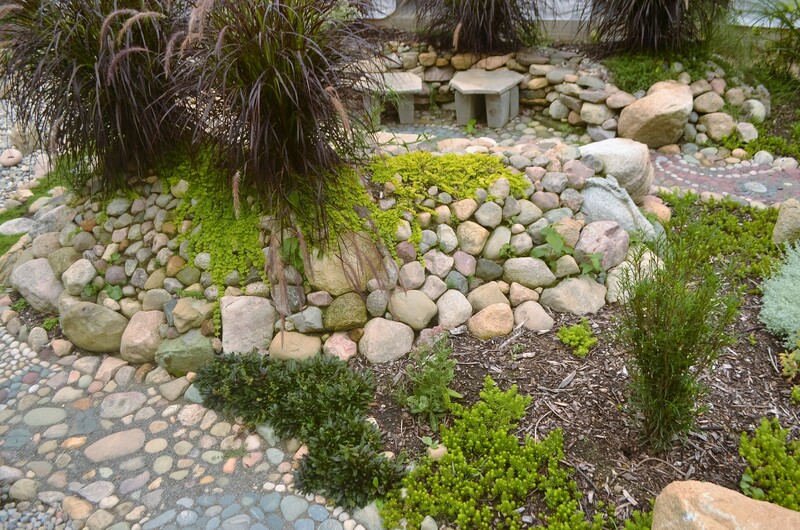 Rob designed this garden to have a more tropical, Mediterranean feel. 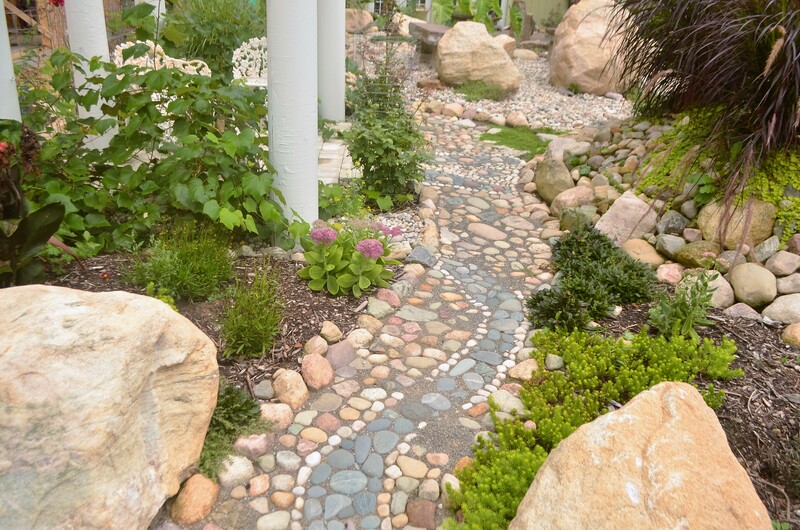 He used a variety of succulent plants and large-leafed elephant ear plants to achieve this effect. 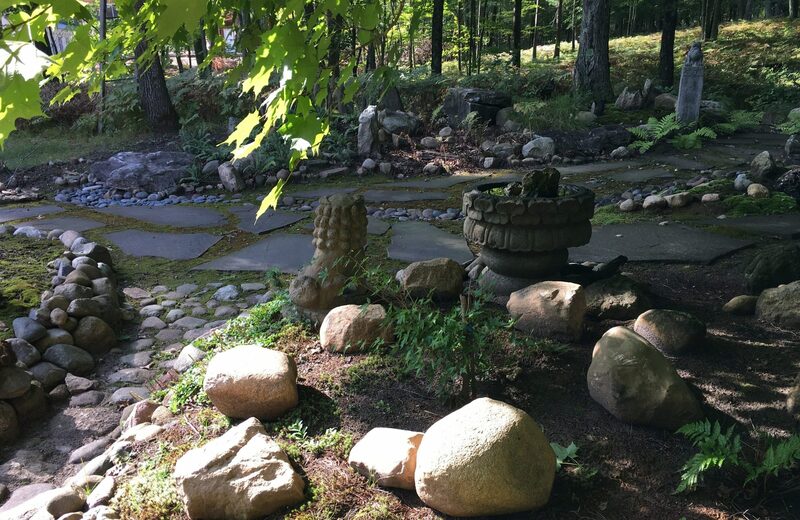 Large boulders from the property were used to create a raised berm for water drainage which is extremely important when designing a courtyard garden surrounded by wooden structures. Trenches were dug which lead downhill for over 100 feet and empty into the forest. The garden drains beautifully with no puddling of water. 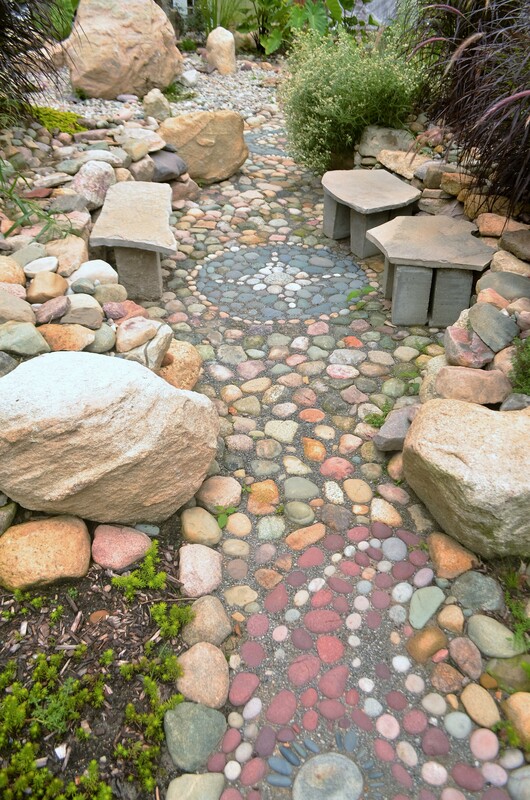 The intricate cobblestone pathways are all hand-designed and placed by Rob using stones he selected from the shore of Lake Superior. There are three separate seating areas for guests to enjoy: under the columned arbor, in the stone garden and in the raised berm area. This garden is the perfect place to enjoy a morning coffee, an evening tea or to sit and stare upwards to the amazing Milkyway at night. There is no light pollution in this area since there are no other houses around, so star-viewing is amazing on clear nights. The best part is that Rob and his guests can relax and enjoy this garden together in the evening and at night and feel comfortable and safe from the night time animals since the garden is completely gated and surrounded by walls.